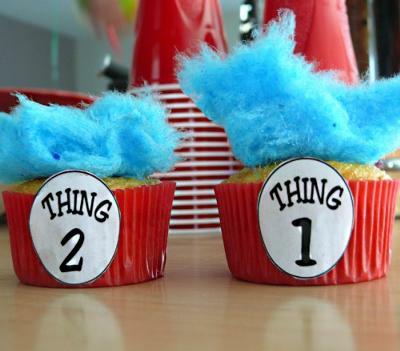 Thing 1 and Thing 2 Cupcakes with Wild Blue Hair make this a fun party idea for any Dr. Suess or Think 1 and 2 birthday. Here are some tips on how to make them. Just prepare your cupcakes as directed on the box or your favorite recipe. Let cool and frost. Add a dollop of frosting to the center of the cupcake and add the blue cotton candy to the top. Make Add a little extra because once the cotton candy touches the frosting, it will start to melt. The more you add, the fluffier it will stay. Find a picture online or make your own and print out Thing 1 and 2. Cut your circles out with your Thing 1 and Thing 2 messages on them. Use a small dot of quick drying thick Tacky craft glue or glue dots in order to secure them to the outside of the cupcake wrapper. Regular glue or tape just won't hold with many cupcake liners. These Thing 1 and 2 cupcakes are perfect for a birthday party, celebrating Dr. Seuss or just for fun. Or perfect for a classroom activity. Read Cat in the Hat and serve these fun cupcakes after. A Wilton "grass/hair" decorating tip was used for the blue "hair". The labels were printed on the computer. 3-D glue dots were used to attach them to the cupcake wrappers. 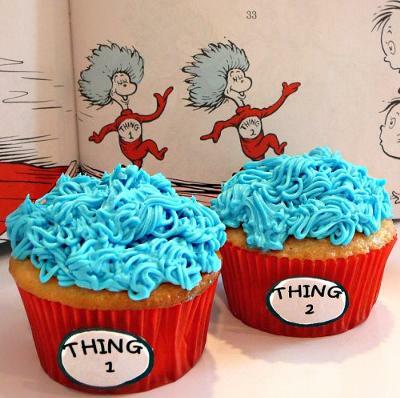 Special thanks to Allison for sharing this creative version of Thing 1 and 2 cupcakes!